Ozarks Technical Community College hosted a dedication ceremony for its Emergency Medical Services (EMS) program Thursday, Aug. 2. The program, co-sponsored by CoxHealth and Mercy, trains students for careers as emergency medical technicians and paramedics. It also provides continuing education opportunities for individuals who currently work in the field. At the event, both CoxHealth and Mercy officials spoke to the benefits of their partnership with the college. Jon Swope, president of Mercy Springfield Communities, added that the partnership will not only benefit the students in the program, but also the patients who receive their care. 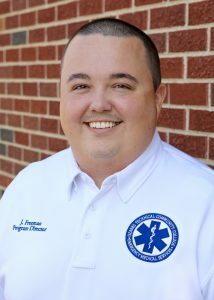 As part of the partnership, Dr. Matthew Brandt of CoxHealth and Dr. Tom Lewis of Mercy serve as the EMS program’s associate medical directors. The two provide program oversight, which includes classroom instruction, curriculum development support and clinical-rotation planning. With the support of CoxHealth and Mercy, the college’s EMS program has the capacity to train 80 EMTs and 44 paramedics by spring 2020. OTC’s EMS program was established in 1998. The college also plans to debut EMS programs at its Hollister and Waynesville locations within the year.